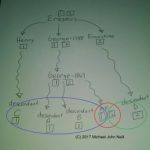 Keeping all your genealogical information to yourself may seem like a good idea, but researching in total isolation increases the chance you don’t find what you are looking for. 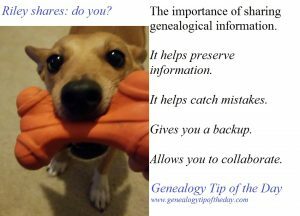 Riley (the dog in the illustration) may be more “in-your-face” about sharing than genealogists are, but it’s still a good reminder. What Barbara said. Especially when people download my pictures and then upload them as their own. And the people who add my information to their locked tree. I have no idea who they are associating that information with. Sharing information with family members has been very rewarding for me. I highly recommend trying even though it can be frustrating or rebuffed. I successfully made contact with two second cousins and two first cousins once removed that I had never had direct contact with before. They gave life to what had just been names and dates. And last night, my second cousin found an old family album with a gravestone picture that finally broke down one of my brick walls!! Riley needs to come play with my dog Bailey!